With the opioid epidemic affecting primary care and health centers with many complex issues, CHCACT is excited to offer a Project ECHO (Extension for Community Healthcare Outcomes), providing learning, collaboration, and support to our health centers. CHCACT is the first primary care organization in the world to offer a Project ECHO hub! The Chronic Pain & Addictions ECHO sessions take place twice a month. Each session includes a didactic curriculum developed by CHCACT's specialist panel (from UConn), as well as deidentified case presentations by health center participants. These case presentations are critically important for knowledge building and sharing. The goal is to present cases that involve common clinical scenarios as well as difficult, complex, or challenging presentations to support health center providers in their everyday clinical practices. Benefit from the collective expertise of multi-disciplinary specialists, including experts trained in addiction psychiatry and chronic pain management, as well as the experiences of other practitioners who provide direct patient care. Build confidence in caring for complex patients and enable some treatment to be provided at the health center level. May prevent or delay the need for specialist referrals keeping the patient in the medical home. Join a supportive network of peers (or “community of practice”). Receive AMA Category One CMEs credits at no cost through CHCACT. 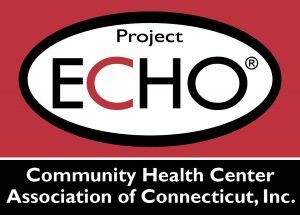 For more information about Project ECHO, contact Marlene Moranino.